The high-point of a consistently strong series, and a great showcase of adventure game design that fits the story's theme. It's fitting that, in the year the old guard of adventure game creators return with Broken Age, Broken Sword and Jane Jensen's Moebius, the Blackwell series reaches its conclusion. Across four previous games (and The Shivah before them), Wadjet Eye's paranormal investigations have quietly provided a confident variation on the classic point-and-click. The Blackwell games have never felt like an attempt to deviate from the genre's puzzle-based history. Instead, their focus has been on finding interesting twists on inventory management – where information is as manipulable as items. It's a practice that's honed further in Blackwell Epiphany, the fifth and final game. Aside from a few of missteps across its multiple paths of enquiry and interrogation, it's a well-paced and accomplished finale. As before, you play as both Rosa Blackwell, the coffee addicted psychic investigator, and her partner (and dead guy) Joey Mallone. During Epiphany's opener it seems like business as usual – the pair tracking down ghosts in order to help them find peace and cross over to the other side. Soon, though, they witness something new: a soul being painfully torn apart before disappearing entirely. In solving this spectral destruction, the duo must navigate unhelpful suspects, a wary police department and a growing list of restraining orders. For all the game's spiritual elements, its success is in how grounded its puzzles feel. When faced with one of the many locked doors Rosa will encounter, the solution is not in some convoluted leap of logic involving rubber chickens or cat hair moustaches, but instead to find a key. There is an inventory, but it remains sparse throughout. If you can pick up an item, it's almost always apparent why and where it will be useful. The other way past a locked door is to send in your ghost pal. Joey has limited agency in the world – able only to blow on small items – but can easily enter otherwise unreachable places. It's a consistent interaction, and the clearly flagged rules and limitations of the pair's partnership keep you from chasing fruitless solutions. If an object is too large for Joey to manipulate, then his role is to observe; gathering clues that will later help Rosa gain entry into the room. As the corporeal half of the team, Rosa's role isn't just heavy lifting. She's also required to question characters, based on information previously gathered. Moving a puzzle forward usually requires searching an area, gathering up any clues, talking to a character, and then following any leads the interrogation shakes loose. A primary part of this process is Rosa's phone. It collects up the clues that the pair find into a list that can be directly used to question suspects. In addition, a search feature lets you trawl the game's internet for news articles and information. If a name comes up over the course of the investigation, searching for it can reveal a place of business, which can lead to a new clue that, when combined with a previous one, gives Rosa a new point of enquiry. In this way, Epiphany doesn't feel like a collection of puzzles. Instead, it's a series of threads that you pick and pull at. It rarely requires you to work backwards; to fill out the steps between you and a solution you've already worked out. You're constantly asked to analyse new information, and the enjoyment comes from making the right connections and having your hunches confirmed. At its best, it's as close as a non-systemic game has come to making me feel like I'm doing detective work. The process isn't always smooth, thanks to a hint system that isn't up to the task. At any point in the game Rosa and Joey can plot their next move, but the few times I did so, they lead me astray. At one point late in the game, I became stuck—unsure of how to proceed in the case I was pursuing. When prompted, Rosa and Joey thought they should again question a particular character. After repeatedly doing so, I eventually realised that that the solution lay in a lead she'd already given me, and one of the game's less intuitive interactions. Maybe that's a lesson about trusting your instincts, but it's hard learned when delivered by a game's own protagonists. That so much of the game is so well executed makes the weaker puzzles seem notably egregious, but for the majority of the story, Epiphany is a solid evolution over its predecessors. That's equally the case in its presentation, with the character sprites and painted backdrops feeling more expressive and readable than past games. And while the voice recording set-up still sounds endearingly unprofessional, the actors do a great job conveying the tragic weariness at the heart of the plot. While the majority of the game works surprisingly well as a standalone entity, it would be a shame if this was your jumping on point. The full series is worth investigating, and only gets better with each successive entry. Thanks to crowdfunding, the health of the genre is no longer in doubt. 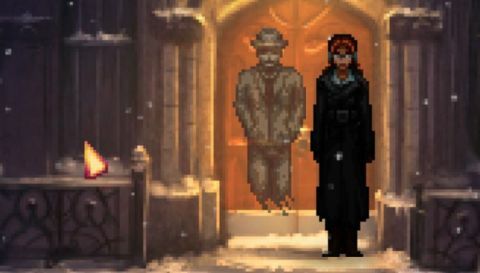 If we're lucky, future point-and-click adventures will take note of the lessons the Blackwell games provide.